Rummy Circle is bringing back the Jumbo Tournaments in a new style with bigger and better cash prizes. The Jumbo Tournament is a two segment event, one being offering a cash prize to all the players who participate and the other, a normal weekly tournament in which only the winner will be winning the a huge cash prize. The promotion named Jumbo Everybody Wins says everybody who participates in the tournament will take home a guaranteed cash prize of up to Rs.1 lakh. 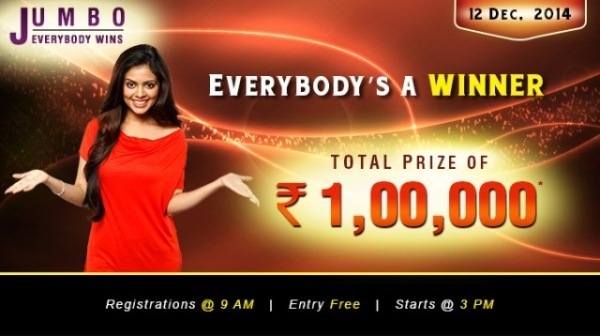 The second tournament is named Jumbo – Weekly Tournament for a cash prize of up to Rs.20,000. The Jumbo Everybody Wins tournament is scheduled for Friday, 12th Dec at 3:00 PM. You can register for the tournament for Free between 9:00 AM and 2:55 PM. Jumbo Weekly Tournaments by Rummy Circle begins at 2:30 PM every weekday and the registration will open at 11:00 PM until 2:25 PM. The tournament is open for cash players only and you don’t need to pay a dime to book your seats. Just login to your Rummy Circle account and join the weekly tournaments and everybody wins tournament for the ultimate pleasure of playing online rummy and winning real cash. To know more about Rummy Circle and the special tournaments they bring, click on our Rummy Tournaments category. Also, give us your valuable feedback in the comment section after trying your skills and luck in these promotional tournaments.